There's nothing more patriotic than throwing a Fourth of July barbecue, and an outdoor barbecue isn't complete without a bounce house. 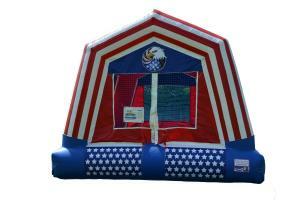 Our All American Bounce is one of our most celebratory moonwalk rentals for this great country, featuring the flag's iconic stripes and all 50 stars. And if that wasn't enough, an eagle is perched right in the center of this bouncer.